The anti-climax one can call it; the fall in action. Carnival Tuesday sits at the edge of the carnival season. While it does not start up with a bang like Carnival Monday, one cannot omit this day. For this is the day which best defines Dominica’s carnival. From 10:00 am, the carnival parade begins. All winners from competitions held during the season are seen parading through the streets. The beauty of this day though, lies with the diverse range of costume bands and floats slithering through the streets as the people sway gently to the calypso music. It is a kaleidoscope of costumes which represent various cultures and natural elements. Fascinated onlookers bask in the splendor and beauty of the parade while those who are a part of the parade proudly and elegantly dance to the cadence brought forth by either live bands or hi-fi. This day may seem to be quite a wind down from the day before. But it is one which forces onlookers to reflect on the creative nature of the Dominican people. It is here, that we see what true Dominican beauty is, and why Dominica is said to have the most original carnival in the Caribbean. Where else can the visitor go and be greeted with such a juxtaposition of costumes? Right after a band of graceful nature costumes, one is awaken by the horrendous face of a Sensay which sends fearful children screaming and seeking refuge under the skirts of their mothers. Or, after a band of children dressed as little angels, and adults in gold with huge angel wings, from nowhere breaks forth a band of Black Devils hitting their long hard whips against the asphalt streets creating a crackling sound frightening both children and adults alike. 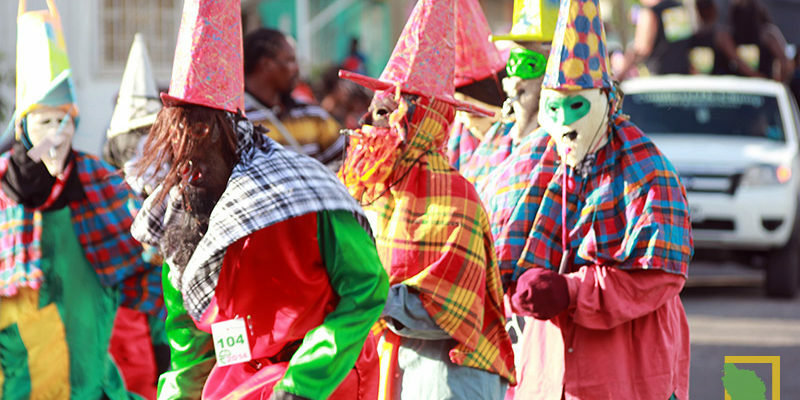 Carnival Tuesday in Dominica is exactly what a carnival thirsting visitor may need. By 3:00pm, it may seem that carnival is over as people begin to make their way home. The parade is over. Costume wearers have gone home to freshen up themselves. Perhaps get that energy drink to boost their bodies. Come 6:00pm, the people will be back. Just as the sun shoots its orange haze across the skies, and it waves goodbye to the happy islanders, people are seen crawling out of their homes in every inch of the island. Carnival cannot end. Not before last lap. And so by 6:00pm the streets are flooded with the masses again. Everyone must jump. Yes there will be work tomorrow, but not before citizens release their flesh again. What! With Ash Wednesday waving hello, there will be no more fun and frolic for the next forty days. So why not get all that one can from Carnival Tuesday? And so, just as it seems like carnival is over, the visiting onlooker must ask if it is the beginning. The people will jump bigger and better than they did on Carnival Monday. Their bodies must be satisfied. And so the hours zoom past all too quickly. At 10:00pm, the bands must stop. The people have not had enough. And so, just as they are walking away from the scene, they begin to give their opinions of the carnival season. Most amazing though, are the plans already being made for the next carnival season which is… A whole year later!